As June presses on, we’re getting closer and closer to that most joyous event that comes but once a year - and no, we aren’t talking about the Summer Solstice, but rather Pride, Pride, Pride! Yes, PrideFest STL 2018 promises to be an amazing confluence of people and performances and we couldn’t be more thrilled to be involved. However, the St. Louis Pride celebration shouldn’t necessarily take all the limelight, because there are tons of awesome and inspiring events taking place in the run-up to the June 23rd opening of Pride in downtown St. Louis. So, let Gateway Men’s Chorus walk you through all the regional Pride events that you won’t want to miss with our 2018 Pride Guide! First up, in just a few days on June 9th, GMC will be on the other side of the river, kicking off the festivities at Metro East Pride on West Main Street in Belleville, IL. We take the stage at 12 Noon and will be performing a sneak preview of the music from our upcoming stage show, Love Is All You Need, featuring timeless music from the Beatles repertoire. Then, not a week later, starting Friday June 15th GMC will be hosting the final show of our 31st season, Love Is All You Need, at the lovely Ivory Theatre (7620 Michigan Ave, St. Louis, MO 63111) in St. Louis’ Carondelet neighborhood. We will be performing Friday the 15th, Saturday the 16th and Sunday the 17th, and are offering a special Family ticket package to the Sunday matinee show for 2 adults and 2 children for a mere $60. The fun doesn't stop at the Ivory Theatre, though! The same weekend we are performing Love Is All You Need, we will also be taking time to head out west to Pride St. Charles to take part in the festivities. Join the Gateway Men's Chorus Saturday, June 16th, from 11am-6pm, in Frontier Park (500 S Riverside Dr, St Charles, MO 63301) to meet the singers and volunteers, play games and win prizes! You can also learn how to participate in the chorus for our 32nd concert season. We'll have a booth at the festival all day, and we'd love to introduce you to the chorus, show you how we change lives, and how you can get involved with GMC. Finally, the moment you’ve all been waiting for…*drumroll please*...GMC proudly takes to the main stage at PrideFest STL at 2:30 on June 23rd at Soldiers Memorial in downtown St. Louis (1315 Chestnut Street, St. Louis 63103). Before and after the performance, GMC will be manning a booth where you can meet our performers, learn about our organization, play games and win prizes. And, to wrap up the regional 2018 Pride season, GMC will be walking with our brothers and sisters in the Pride Parade on Sunday, June 24th at noon down Market Street in downtown St. Louis. We sincerely hope that you’ll join us for one or all of the wonderful events taking place around the St. Louis region for this year’s Pride celebrations. All promise to deliver plenty of family fun and community building opportunities. We look forward to seeing all of you very soon! Gateway Men’s Chorus Loves….The Beatles! Following up on the success of our fundraiser, Cabaret Risqué, the Gateway Men’s Chorus is proud to announce the final show of our 31st season, Love Is All You Need, a tribute to the timeless music of The Beatles! From engaging ballads to driving rock anthems, the men of GMC will lead the audience through such favorites as "Hey Jude", "With a Little Help From My Friends", "A Hard Day's Night", "Yellow Submarine" and many more, all arranged from the original harmonies written by John, Paul, George and Ringo! The Gateway Men’s Chorus will be performing this ode to the Fab Four June 15th, 16th and 17th. These evenings of psychedelic pop music will be held in the Carondelet neighborhood at the lovely and historic Ivory Theatre. With this venue boasting a spacious 250-person seating area, with nearly every seat in the house providing an excellent experience, audiences of all ages are sure to love this opportunity to be a part of Beatle-mania like never before! 2 - Post the recording on your Facebook or Twitter feed. 4 - If you choose to not post a video, head over to www.gmcstl.org/fab-four-challenge to make a donation to the Gateway Men's Chorus. 5 - Watch the videos of your friends and others around St Louis as they participate in the challenge! Cabaret Risqué: FELLA-nies and MISS-demeanors fundraiser is fast approaching! It takes place on May 5th at the Mad Art Gallery starting at 8:00 p.m. What better way to kick things off than to talk to our emcee, international showgirl Lola Van Ella? 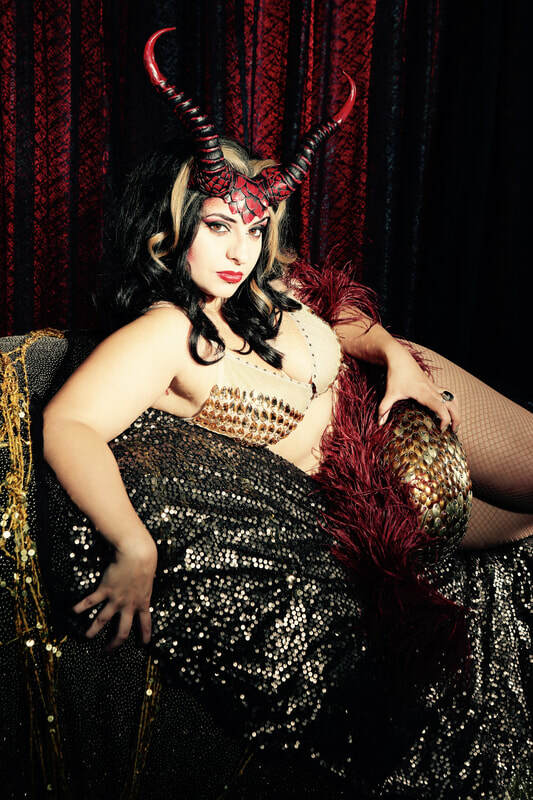 She spoke with us about all things cabaret, risqué, and burlesque! How long have you been doing burlesque performances, and how did you get into it? ​How did you come to work with the Gateway Men’s Chorus? What acts should people look forward to seeing at Cabaret Risqué? How did you become an Internationally-Acclaimed Showgirl? You can learn more about Lola Van Ella and Van Ella Studios at vanellaproductions.com. We hope to see you next month at Cabaret Risqué! Tickets are still available, but we encourage you to act quickly so as not to miss out.